Home » Tips and Tricks » How to keep a background image for every drive in your Computer? How to keep a background image for every drive in your Computer? You can keep different types of images for every drive in your computer. Just follow the simple process mentioned below! 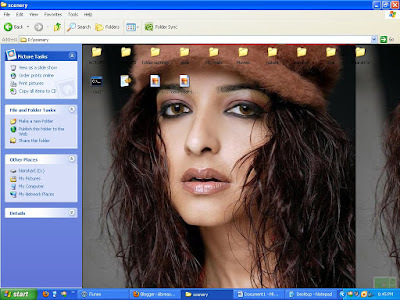 - Create a folder named as "Folder Settings" and place the images which you want to keep them as background for the drive." - Now open a notepad and copy the below mentioned data into that and save it as "Desktop.ini"
** NOTE : In the above code please make sure that "IMAGEFILENAME.JPG" is must be the file name which is placed in the "folder settings" folder. Then the drive will looks like this. Its working dude... just checkout the extension of your image... and its only one file that too.. Desktop.ini along with consisting images in a folder named "folder settings"
then create a text file and copy the above code into the text file and save it as "Desktop.ini"
and in the code where "IMAGEFILENAME.JPG" you should replace it with your image name. I mean if you place abc.jpeg image into the folder settings then you have to replace "IMAGEFILENAME.JPG" with abc.jpeg please check the file extention of your image it might be problem ther .. if it is jpg/bmp/png/jpeg the same extention should be used in the Desktop.ini file. if you r using window7 or vista i dont know exactly whether will it work or not ? I am also waiting for W7 version for this type of feature..